Writing my last post on the pros and cons of shift work led me to ponder what matters most in a job and how wildly that varies from person to person. “1. Figure out what you like to do for fun in your spare time. 2. Figure out what career track will get you as close as possible to being able to get paid a livable salary, while doing that thing every day. Even if the only thing you love to do is sit around and watch movies, figure out what it is that excites you about it, and find a way to apply it to a career path. Maybe you’re okay with being on call or working rotating shifts. Maybe you do your best work early in the morning or late at night. Or maybe you want to work flexible daytime hours to accommodate your family. Maybe you’re okay with travelling a lot for work. Or working all hours to grow a startup. Personally, I like pretty regular hours. Hardly needs to be said, but … It’s always nice to not constantly be worrying about whether your job is in jeopardy. Is it a pleasant place to be in physically? Is it a healthy working space? While my office is always far too cold and dusty, I do sit by a wall of windows. A view of the outside makes a real difference. Possibly the most important social aspect, because a bad boss or horror colleague can turn a dream job into a nightmare job. Inconsiderate, incompetent coworkers can also ruin things. Sometimes you can ignore them or minimise contact, though. Very few workplaces are ever going to have a 100% awesome staff. You don’t have to like everyone, but you do have to get along with them. Although I’m often more productive when working from home and enjoy the solitude, I’m not a naturally social person so it’s a good thing that I’m forced to interact with others when at the office. Maybe I’ve been lucky, but I can only think of three people I’ve ever worked with who really got up my nerves. One fell into the amusing/entertaining category and was thus tolerable, while the other two I actively avoided as much as possible. The thing I would struggle the most with if I had to go back to working in customer service or hospitality like I did in my student days would be the lack of freedom. The strict breaks. The absolute lack of leeway on arrival and leaving time. I appreciate the flexibility to work around the odd personal appointment and make up time as needed, particularly since I have to attend events on my own time occasionally. Junior or senior, treat your staff like grownups and they will be the happier for it, I say. Don’t get me wrong. Enjoying what I actually do at work all day matters to me. But that alone isn’t enough. There are lots of other factors that play into job satisfaction and at least some of those boxes need to be ticked. 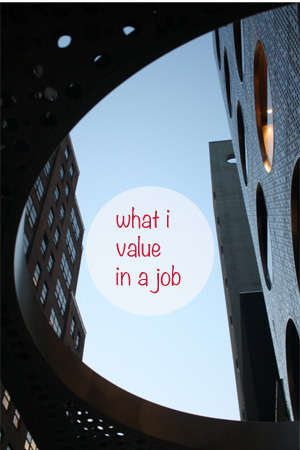 What do you value in a job the most? I value learning opportunities, potential for growth, and training and professional development, especially for women. I value being compensated fairly for my work, and that if I value being rewarded financially I do a good job. In short, I want to work for an employer that invests in its employees. At this stage of my life, I value freedom. As a teacher, I have a lot of freedom. I can conduct my class the way I like. I create the lessons. As a former business person, I make sure they learn enough skills to use in school and the business world. I value stability and having a good mentor/supporter around. I like my steady hours, 8-5, Monday to Friday and knowing that the work is relatively constant. Having a good mentor is really important too, because I’m still learning the ropes so it’s handy having someone who isn’t sick of my constant questions and is always willing to offer up advice. Growth, learning, development. Interesting problems, variety. Autonomy in how to get the work done and working hours, enough mentoring/support to help with growth (not a “mentor” who just assigns lame-o work – I quit a situation like that!). I find I’m most happy in a job where I feel like I’m a significant player and a top performer. I’m not happy being in the peanut gallery. As long as I don’t feel my salary is wildly out of whack, it isn’t the biggest motivator for me. I’m more motivated by appreciation shown in the day-to-day. I enjoy meaningful work, pleasant surroundings, opportunity to interact with others (collaboration), and leadership who sets a pace. Thankfully I have all of those and more where I work. One more thought – step 1/2 is really hard, at least for me, and especially when you are kind of starting out (before college, or even just at the end of college). I absolutely LOVE my job, but I would have never sat down and thought of it if I tried to come from “what do I do in my spare time”? For me, it was more, “hmm, I am good at math and enjoy it, this career uses it…” I wasn’t doing math in my spare time. I don’t even do that much in my day to day job, though it is a highly analytical job. Great post. Thanks for this. The stability argument is definitely key; great insight. that`s some decent advice! I thought a lot about what I wanted in a job when becoming a student, and many of those are mentioned here. For me I wanted a stabile job, decent salary and regular hours, so combining that with my passion for language, becoming an English teacher seems like just the thing for me! I like to learn new things and then share them with other people. I *think* I’d probably be happier if I worked at a reference desk or something like it that involved digging into varied subjects. However, one thing I’ve learned about my personality over many years is that I tend to tackle a subject/skill for a while (months, years) and then drift away from it. With this in mind, I doubt there is one thing I could commit to that I am “passionate” about and could make a living doing. So instead, I’ve chosen to stick with working someplace that has values similar to mine, that employs smart and (mostly) nice people, and compensates me well. That way I can afford a lifestyle that lets me throw myself into the hobbies for which I currently have a passion. And if those hobbies change over time, it’s no big deal because I’m still paying the bills on time, saving, and having a pretty good life. Ever read Refuse to Choose by Barbara Sher? It’s all about people like that – who like to delve into things and then move on to new ones (which I think also describes T). I think what you’ve done – pick pleasant work that allows you the time and disposable income to pursue your other interests, is the way to go. Totally showing this to the boyfriend. He’s trying to figure out what to study after I graduate this semester. It’s not an easy decision, but I think asking these questions may just do the trick! I value meaningful work (not just busy work) where I feel like I’m making a difference. I value normal work hours (for 3 years I worked nights and never saw my family or friends). I value ability to move up within the organization. If I didn’t see a path to promotion I wouldn’t stick around very long. My current job is a good example for this — I love my job. I love the hard work, great coworkers, and the ability to grow as a young women. I think that no matter where you work, you need to be able to enjoy your surrounding, like your work, and have good coworkers. For me, it’s all about the people. I’m looking for an awesome manager who I can connect with and awesome coworkers that I can have a beer with. At my current job, I have both. My coworkers are smart and fun and I adore my manager. I pretty much knew at my interview that I would accept the job, if they offered it to me – we just clicked!